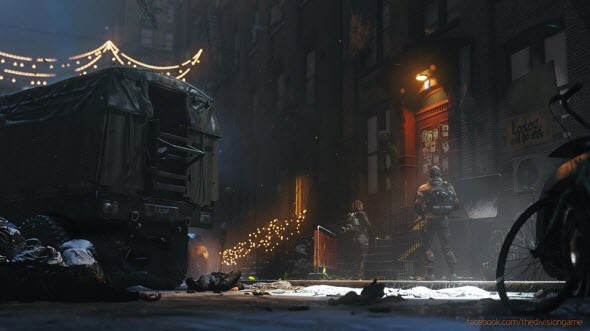 The Division game (or Tom Clancy’s The Division), which has been announced this summer, got its first screenshot yesterday. The game’s publisher - Ubisoft company - presented one project’s picture in order to celebrate an important event for it, namely the fact that the number of people subscribed to the game’s page in Facebook has reached 100,000. Let us remind you that The Division game is a project, developed by Ubisoft Massive company in the genres of TPS and MMO RPG, which is scheduled to be released in Q4 2014 for PS4, Xbox One and PC. The game takes place in New York, destroyed after a powerful biological terrorist attack, which was actually another one government experience designed to find out whether the latter one will be able to deal with this threat or not. But, as it turns out, the government not only failed to stop the epidemy, but it is almost helpless. And here we meet special Strategic Homeland Division (you are the part of this group, of course), each member of which usually works as an ordinary citizen - a physician, a scientist, an engineer or a policeman. But now, with the collapsing world and actually the apocalypse, they all come together with a single goal - to combat the threat, to preserve the remnants of society and try to restore the former global order.